This, is the updated version on how to set things up properly. In this post, I’m going to show you needed steps and downfalls on running a LUKS encrypted Ubuntu Server setup and how it can be extended to allow remote unlocking. It is assumed that you already know your way around ISO files and how to boot them on your server. These steps would completely remove any leftover partitions and their associated data on the drive without the possibility to recover. Consider yourself warned! We are going to use LVM inside the LUKS container, it is not only supported, but the recommended way as we could also make use of advanced LVM functionalities later on. The process behind this fairly simple. The kernel loads initramfs image, inside this image are the required files/modules/scripts for decrypting/mounting root. Now if we could somehow run a SSH server in initramfs and make it accessible via network, one could remotely connect to it to unlock root partition. As initramfs runs in memory, we are somewhat limited in the size and complexity of the running programs. This is the main reason why Dropbear is being used as the SSH server combined with BusyBox to provide the shell and basic utilities. All provided steps require root access. 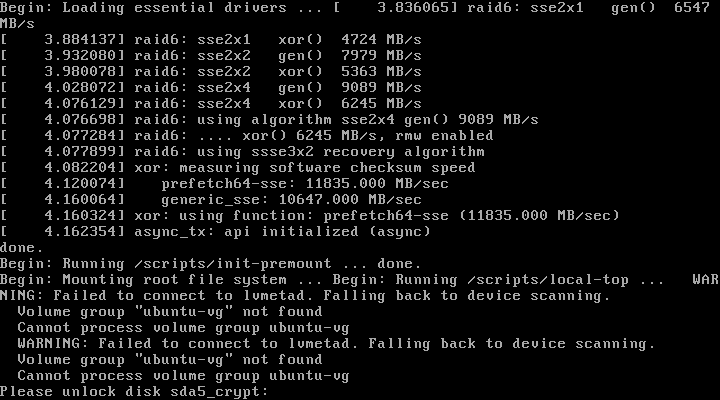 So you might want to sudo -i to root before continuing. dropbear: WARNING: Invalid authorized_keys file, remote unlocking of cryptroot via SSH won’t work! When you install the package for the first time, it also generates dss,rsa and ecdsa host keys3 placed in /etc/dropbear-initramfs/. Although possible, It is not wise to share your real OpenSSH host keys with the dropbear-initramfs ones. 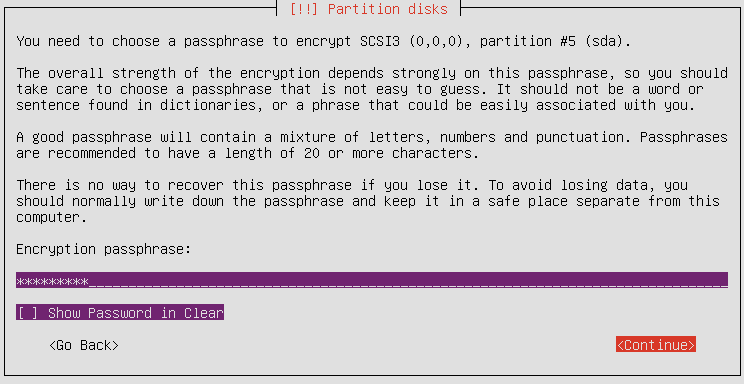 This is because for the keys to be accessible by the SSH server, they must not be encrypted (The same also applies to the initramfs itself as the kernel needs to be able to load it). The downside of using a different private key for the Dropbear server, is that it will likely result in the client getting a scary warning about the possibility of a man-in-the-middle attack. This is because the server keys would be different before/after unlocking the root partition. The simplest (and possibly the best) way to avoid this issue, is to run the Dropbear SSH instance on another port. We will cover this shortly. For the reason discussed above, we’re better off using a custom port to listen on. This also would have the advantage of reducing attacks on the server, as no firewall is running in initramfs environment. A user reported that for some reason, the above method did not work for him and he added the same line to /etc/initramfs-tools/initramfs.conf instead. I have also added -s -j -k -I 60 to DROPBEAR_OPTIONS just for the peace of mind. See man dropbear for details. Password login has been disabled for dropbear-initramfs and only publickey authentication is allowed. Public keys should be placed in /etc/dropbear-initramfs/authorized_keys, one entry at a line. rsa based authentication is advised over ecdsa and dss. You might need to issue ssh-keygen on the client first if this hasn’t been done already. This time, no error should appear. 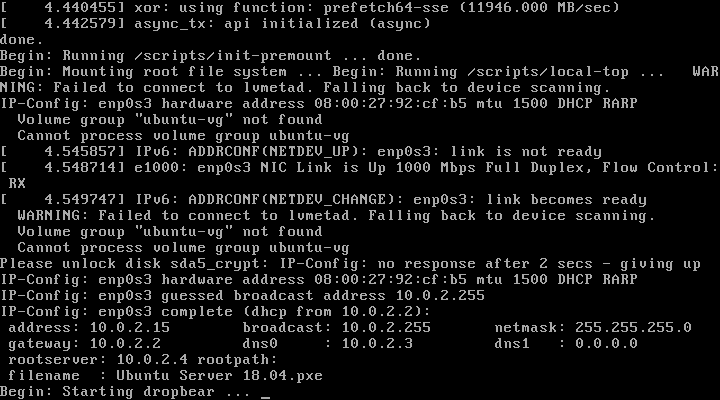 Connecting remotely to the SSH server, would require the kernel to be able to setup network interfaces properly. This would require that the kernel to first recognize the network interface (which is usually the case4), and also be able to setup IP parameters correctly. The above line, uses the same structure for most part. Except that its location is different and it uses the capital IP variable. BusyBox v1.27.2 (Ubuntu 1:1.27.2-2ubuntu3) built-in shell (ash) Enter ‘help’ for a list of built-in commands. cryptroot-unlock command is all that stands now between you and booting up your server!